Geist’s Glitch Robot pictured here is one of many experimental concepts that he tries out with his team. Courtesy David Campesino. Kraftwerk’s enduring 1978 electro track “The Robots” depicted machines that were “programmed just to do/anything you want us to”—but those robots weren’t actually playing the music. Forty years later, German musician, engineer, and educator Moritz Simon Geist is bringing the promise of musical automatons full circle on his debut EP, Material Turn (2018). Every sound on this unique collection emanates from one of Geist’s many homespun Sonic Robots. Geist’s robots don’t spit out the rote bleeps and bloops usually associated with robotic techno music. 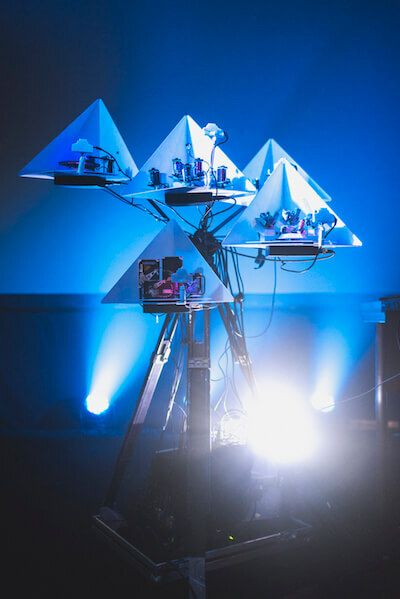 Using struck glass, Styrofoam bubbles inside an air compressor, a metal-tined kalimba, and many other contraptions, the Sonic Robots create acoustic sounds full of texture and variation. Moritz Simon Geist plays about 40 live shows a year with his band of Sonic Robots. Courtesy Piru de la Puente. Classically trained on piano and clarinet as a child before playing in Krautrock and punk-rock bands for years, Geist studied and worked in electrical engineering before taking the leap into a creative life that merged his love for music and robotics. 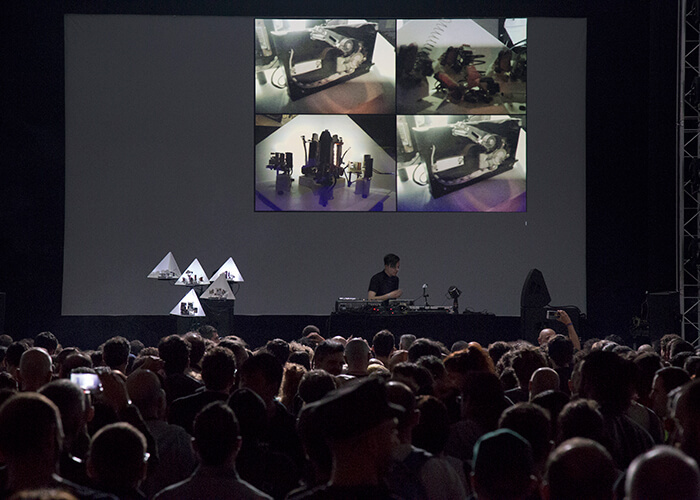 His first musical installation, 2012’s MR-808, re-created a famous drum machine as an oversize interactive instrument with robots playing acoustic drums. Now, after several years of designing, testing, and reiterating his Sonic Robots, Geist has released Material Turn, with the full-length album Robotic Electronic Music to follow in November. Veteran electronic-music duo Mouse on Mars produced both collections and mentored Geist on the importance of achieving rich and characteristic sounds from his robots. However, the acoustics continually present Geist with challenges unique to music-making robots. Of the many robotic concepts he attempts, Geist says about 60 percent of them fail due to unforeseeable physics that cause problems. But when Geist and his crew shot the video for “Entropy” over a two-day period, a static charge from the Styrofoam would build up, causing the bubbles to stick to the cylinders. They tried to insert some metal into the cylinders to discharge the static, but when that didn’t work, they had to constantly spray outside air into the superdry cylinders to make them more humid inside. “Stuff like this that you would never think of happens all the time,” Geist says. The centerpiece Sonic Robots must be physically sturdy, produce compelling sounds, and appear visually elegant. Courtesy Moritz Simon Geist. His other big design challenge is making his Sonic Robots visually appealing for photos, videos, and the 40-odd live performances that he does each year. Geist makes his basic robots using Autodesk Eagle to design the circuit boards, but many of them are too fragile or visually sparse to leave his studio. For his centerpiece robots, Geist repurposes old hard drives, guitars, and other objects to supplement the parts he designs in Autodesk Inventor, then 3D prints or laser cuts with a CNC mill. For the five-robot Tripods One installation, Geist took design inspiration from the “used futuristic” look of movies such as the original Alien. Courtesy Moritz Simon Geist. With both sonic and visual aesthetics in place, Geist wants nothing more than to change people’s concept of electronic music—moving away from prepackaged, mass-produced sounds and toward the hacker spirit of deconstructing technology and then building it back up into something new. 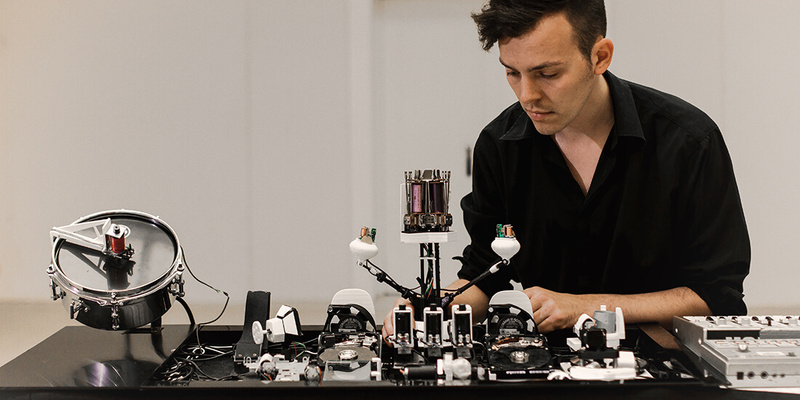 Explore the software Moritz Simon Geist used to design his Sonic Robots. At the intersection of art and science where Geist operates, he could easily lose the balance between the two, but he’s focused on serving the music with technology, rather than the opposite.